Ancient Mars was warm enough to support liquid water in at least one site on its surface, according to clues from a 4.1-billion-year-old meteorite from Mars, scientists say. Still, how long and widespread such warmth was remains highly uncertain, meaning it is still a mystery as to whether Mars could have once supported life, researchers added. Now analysis of an ancient meteorite from Mars — the oldest known fragment of the Red Planet's crust astronomers have — has revealed "the first direct evidence for relatively warm temperatures on the surface of early Mars," study lead author Itay Halevy, a geochemist at the California Institute of Technology, told SPACE.com. 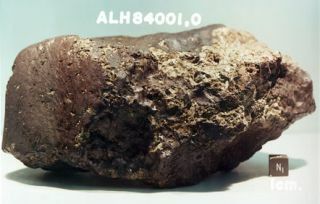 The Mars rock in question is known as the Martian meteorite ALH84001. It was discovered in Antarctica in 1984. The meteorite was likely blasted off Mars by a cosmic impact, eventually landing on Earth. The rock is the same meteorite from Marsat the center of a long-running debate over whether its strange features are the result of microbial fossils or just regular geochemistry. By testing a sample from this 5-pound (2-kilogram) meteorite, Halevy and his colleagues inferred the watery nature and mild temperature of the environment the rock originally formed in on early Mars. Specifically, the researchers analyzed isotopes of carbon and oxygen in carbonates in the meteorite. All isotopes of an element have the same number of protons in their atoms, but each has a different number of neutrons — for instance, atoms of carbon-12 each have six neutrons while atoms of carbon-13 each have seven. The researchers dissolved 3 grams of the carbonates in the sample in acid, which released carbon dioxide, which possesses both carbon and oxygen. By comparing the carbon-13 and oxygen-18 levels in this carbon dioxide, they estimate the carbonates formed at about 64 degrees Fahrenheit (18 degrees Celsius). The carbonates also apparently formed in a watery environment, one that gradually dried out, Halevy said. The scientists reached this conclusion after their analysis found the solution in which this material grew from apparently lost its lighter carbon and oxygen isotopes over time. The lighter isotopes of carbon and oxygen prefer to make their way into gases such as water vapor while heavier isotopes favor denser homes such as liquid water. The loss of these lighter isotopes is consistent with the loss of water vapor and carbon dioxide gas from a watery reservoir, Halevy and his colleagues suggested. However, although these findings suggest that parts of Mars were warm and watery, "they do not mean there was life on Mars," Halevy cautioned. "We found one environment there was water and mild temperatures, but we don't know how long it was warm and if it was warm elsewhere, so this alone cannot reflect on how suitable Mars was for hosting life." He added more data from upcoming missions such as the Mars Science Laboratorycould help better understand the history of the Red Planet. Halevy and his colleagues Woodward Fischer and John Eiler detailed their findings online Oct. 3 in the Proceedings of the National Academy of Sciences.